Funds disbursement is a vital part of every organization. 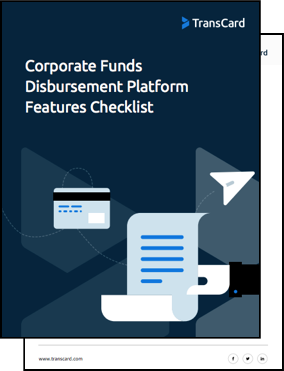 Identify and track the features you need in your next funds disbursement platform. The best platforms offer features that help reduce the time you spend making payments and offers diverse payment options. Download the checklist to gain better visibility into whether the platforms you’re evaluating go the extra mile, or if they’re minimalized to provide only standard tools. Mastercard and the Mastercard Brand Mark are registered trademarks of Mastercard International Incorporated. Visa and the Visa Brand Mark are registered trademarks of Visa Incorporated. Discover and the the Discover Brand Mark are registered trademarks of Discover Financial Services. Copyright 2016 TransCard Payments. All Rights Reserved.